Shutter offset is one of those confounding issues in functional shutter hardware. How to choose shutter offsets? 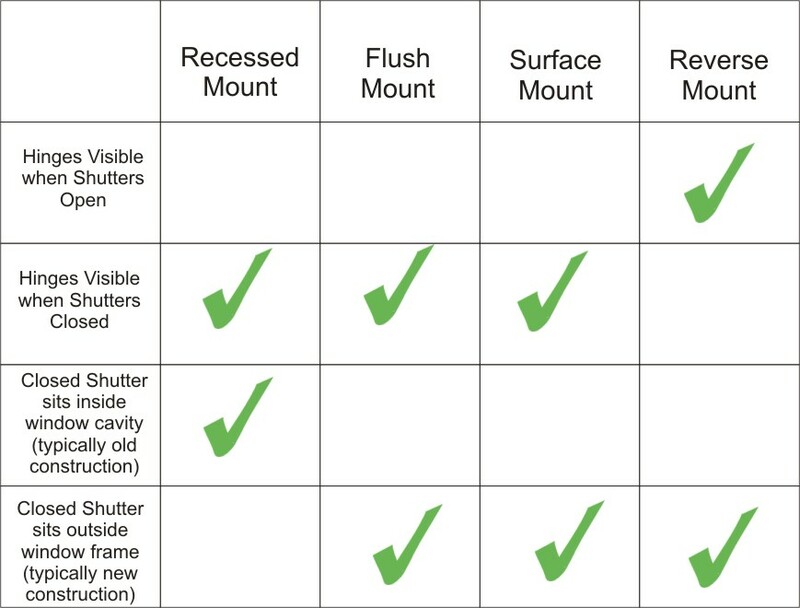 Here is some background information that’ll help you understand the ins and outs of shutter hardware. Functional shutters can offer protection from wind, hail, hurricanes, and projectiles–depending on the shutter specifications. Historically, louvered shutters offered both sun (UV) protection and cooling–when the shutters were closed, the sun was kept out of the house but a breeze could still flow through. The original air-conditioner! To hang functional exterior shutters, you need pintles and hinges. Two pintles and two hinges will hang one standard shutter. Taller shutters can add a center hinge for additional support. Rule of Thumb: For functional shutters, the hinge offset can NEVER be greater than the pintle offset.. 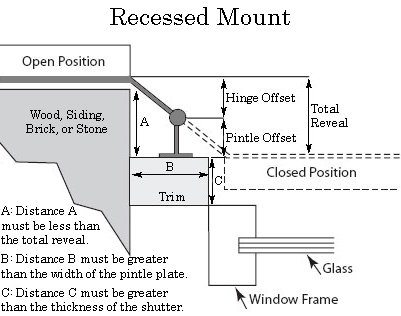 Imagine looking at a window whose shutters are closed, like the diagram below. In the closed position the pintle offset (male) brings the shutter away from the structure while the hinge offset (female) brings it back toward the structure. Now, if you open the shutters, the male pintle is still bringing you away from the structure while the female hinge is bringing the shutter even further away. The total distance away from the structure (shutter offset + hinge offset) is the reveal. 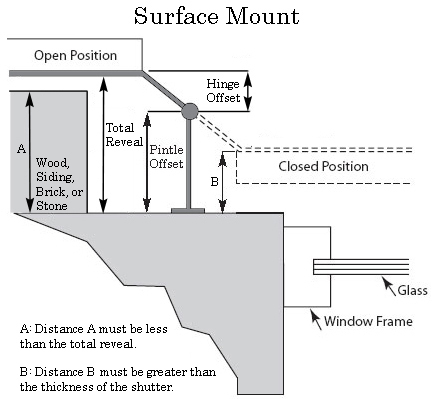 When there is something (like wood siding, brick or stone) around the window frame that must be overcome, the reveal must stick out farther than the brick/stone, just like in the diagram. Pintle Offset: Measurement from the back of the pintle plate to the center of the pintle. Hinge Offset: Measurement of the back of the hinge to the center of the hinge barrel. Reveal: This is the sum of the two offsets. The distance from the back of the pintle to the outermost point on the façade is the “reveal”. Something to Consider: A ventilation gap of about ½” behind your open shutter is recommended so that your shutters aren’t right up against the house. Add that ventilation gap into the total reveal that you need. The buyer’s guide helps differentiate between the four types of functional shutter installations. We’ll be discussing each installation type below. The four installations are Recessed Mount, Flush Mount, Surface Mount, and Reverse Mount. The installation method you use will be dictated by several factors. See the table below to choose what’s best for you. This is the most traditional installation for old construction. The shutter sits inside the window cavity when closed. 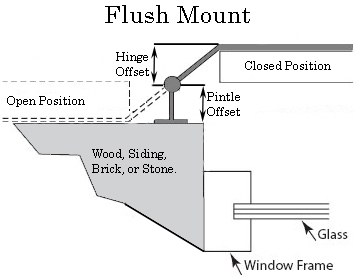 The pintle is mounted to the window trim (B). Be sure that your pintle plate fits in the width of area B. Your trim should sit proud of your window so that there is enough space for the thickness of your shutter (C). 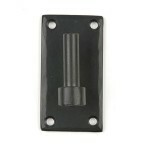 In order to get your shutter to recess into your window cavity, your hinge offset must be equal to your pintle offset. This will allow your shutter to sit flush in the closed position (so that window trim and shutter are all in the same plane). When you open the shutter, your reveal must be enough to swing around the wood, brick or stone (shown in dark grey in the diagram). An excellent option for the Recessed Mount Installation is the New York Style Shutter Set with 1.25″ offset (for a total of 2.5″ reveal). Also available in 2.25″ offset (for brick homes). Shutter Bolts: If you use a shutter bolt, be sure to leave extra space so it doesn’t smack into your window glass when you close the shutters or during heavy winds. Flush Mount Installation is for the customer who wants the shutter to sit flat against the house when open, and in front of the window when closed. In this installation, your pintle and hinge offset need to be the same (or the pintle offset can be slightly larger than the hinge offset). This is the simplest and easiest way to install. You can use any pintle and hinge combination that has matching offsets. Most tract home builders use the Flush Mount Installation. Whereas older homes have windows recessed behind the trim (and thus use the Recessed Mount), new construction doesn’t have recessed windows. In fact, the window trim will often sit proud of the siding and the window glass will be flush with the trim. 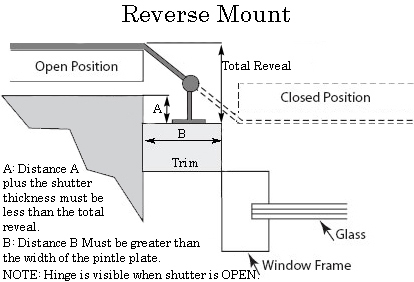 In Flush Mount Installation we reverse-mount the hinge (mount the beveled side of the hinge to the back of the shutter; see diagram above). Instead of the hinge kicking it out away from the structure when the shutter opens, it actually brings it back in line with the structure. Hardware choices for the Flush Mount Installation include: New York Style Shutter Hardware Set with 1.25″ Offset, combination set of Suffolk Style “L” shaped hinge and Rounded Pintle, Stainless combination set of Suffolk Style “L” shaped hinge and Rounded Pintle, or 12″ Suffolk Style Shutter Hinge Set with 1″ Offset (order 2 sets of these for one window). In the Surface Mount Installation the shutter sits in front of the window when closed, and extends even farther away when open. This is one of the most common installations, used in almost all new construction. The diagram above shows brick siding, which usually isn’t applicable in new construction. A typical installation would include a Suffolk Style 1.75″ offset pintle with a 0.5″ offset hinge. The pintle brings the hinge away from the house 1.75″ and the hinge brings it back 0.5″, so the combination leaves 1.25″ for the shutter when closed. This is a very popular default combination for hurricane shutter manufacturers. This set works in almost every situation. Sometimes the construction of the house requires a lag pintle rather than a standard Suffolk Style pintle. This is a really fun installation because in the Reverse Mount Installation you can see the shutter hinges when the shutter is OPEN. This is for the client who wants their shutters to swing and be functional, but also wants to see the hardware when the shutters are open (which they are most of the time). In this situation, the shutter needs to sit between the hinge and your structure when in the open position. The hinge is reverse-mounted with the beveled side of the hinge mounted to the front of the shutter. Example: (.75″ from the front of the trim to the front of the house) + (1.5″ thick shutter) + (.5″ ventilation gap) = 2.75″. Therefore, the reveal must be greater than or equal to 2.75″. In this example, you could choose a pintle with 2.25″ offset and hinge with 0.5″ offset. You can also choose a larger offset for a larger reveal, which will add more angle to the shutter when it’s open. A nice (and forgiving) hardware package choice would be a stainless steel adjustable lag pintle with a straight Suffolk Style hinge.